Flights at Paine Field can be booked starting Thursday, and service is scheduled to begin in February. Alaska Airlines has started accepting bookings for passenger flights from Paine Field in Everett, bringing Snohomish County closer to realizing its goal of offering an alternative travel option to Seattle-Tacoma International Airport. The carrier will operate 18 flights to eight cities beginning Feb. 11, it said in a statement posted on its website Thursday. Those destinations are Portland, Las Vegas, Phoenix and five California airports: Los Angeles, San Diego, San Francisco, San Jose and Orange County. Flights start as low as $39 for a one-way ticket to Portland and $59 to San Francisco. Meanwhile, one-way tickets to Portland from Seattle-Tacoma International Airport on a similar date are $64 and San Francisco they are $59. 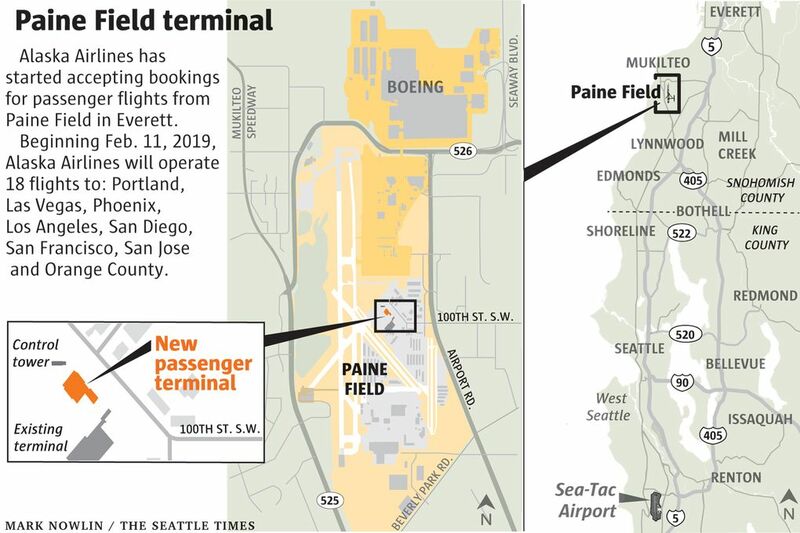 Paine Field has also met Federal Aviation Administration parking requirements, with enough capacity to accommodate 1,100 vehicles, according to John P. Gallagher, a spokesman for Propeller Airports, the private company operating the new airport. The announcement comes on the same day that Southwest Airlines backed out of its commitment to use Paine Field. The airline transferred its slots to Alaska in a private agreement, it said in a statement, citing “business considerations” and without providing other details. Construction of the $40 million passenger terminal that has been cleared by the Federal Aviation Administration to operate as many as 24 flights per day is nearing completion. The facility will become one of the few privately built and operated terminals in the U.S., as most airports are run by local municipalities. 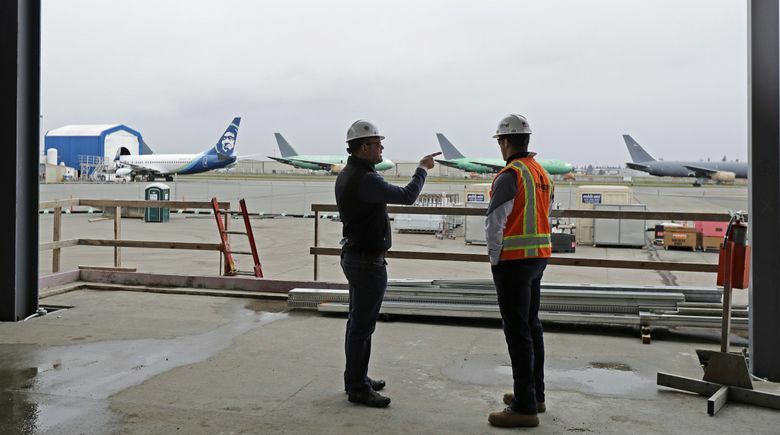 Paine Field is home to Boeing’s testing and delivery operations for widebody jets, as well as private owners of small planes, flight schools and commercial-airline maintenance. Snohomish County, which owns the airport’s land, signed an agreement with a private developer in 2015 to build and operate a passenger terminal for up to 50 years, drawing criticism from some of its residents because of the project’s potential to increase pollution and traffic in the area. Others supported the plan, which the county said would help create jobs and boost local businesses. The project met opposition from Mukilteo residents and city officials who brought a lawsuit to stymie the terminal, but in 2017 the state Supreme Court chose not to hear the case. An analysis released in September by the FAA projected about 656,000 passenger boardings at Paine Field in 2019, and 736,000 in 2024. The increase is based on the possibility of Alaska Airlines and United Airlines — the other airline that’s expected to serve the terminal — replacing their initial Embraer 175 planes with bigger Boeing 737 to accommodate an anticipated growth in demand. Despite the FAA analysis, which said there would be no substantial noise or traffic impact, Mukilteo Mayor Jennifer Gregerson said by phone there are still constituents with concerns about how Paine Field will affect traffic around Mukilteo Speedway and Beverly Park Road. The city recently sent a letter identifying “a handful of places that might be worth a second look” in the FAA’s analysis including the traffic concerns, Gregerson said. “We’re hopeful if we identify additional impacts those will be mitigated,” she said.